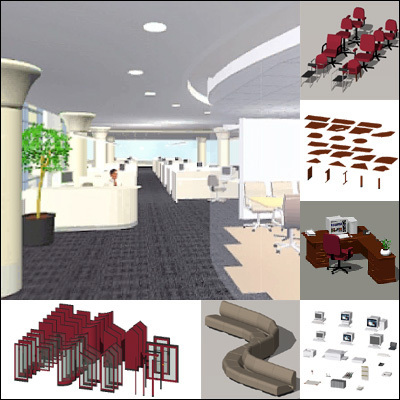 D3 Office Furniture will outfit any size business environment with over 130 parametric objects. This well rounded set has everything from traditional desks and credenzas to fully parametric modular wall panels and desktop systems with optional label code display. Storage components are a snap with file cabinets, shelves and door/drawer cabinets. Put in the final touches using over a dozen office chairs, computers with parametrically configured monitors and keyboards, copier, fax, scanner, phone, and a variety of desk accessories. These objects come pre-assembled into ArchiCAD Modules which make it simple to set up all of the specific colors and sizes. * Traditional desks and credenzas. * Fully parametric modular wall panels to meet any manufacture's office system, featuring curved, sloped and glass configurations with optional label code display. * Modular desktop systems for any shape or angle configuration. * File cabinets - lateral, letter and legal in all standard heights. * Shelves and door/drawer cabinets. * Chairs for task, drafting, executive, side and reception. * Computers with parametrically configured monitors and keyboards. * Copier, fax, scanner, phone, and a variety of desk accessories.